The longer the NBA postseason goes on, the better the game are supposed to be, right? Well—not this year. The Golden State Warriors are making their opponents look like JV practice squads. The Celtics and Wizards can’t decide if they want to be awesome or not. The Cleveland Cavaliers are finding it, so easy LeBron James had time to grab a (pretend) beer during a game. The Houston Rockets-San Antonio Spurs series is the only conference semifinals series that appears like it is going to be interesting—but even that remains to be seen. 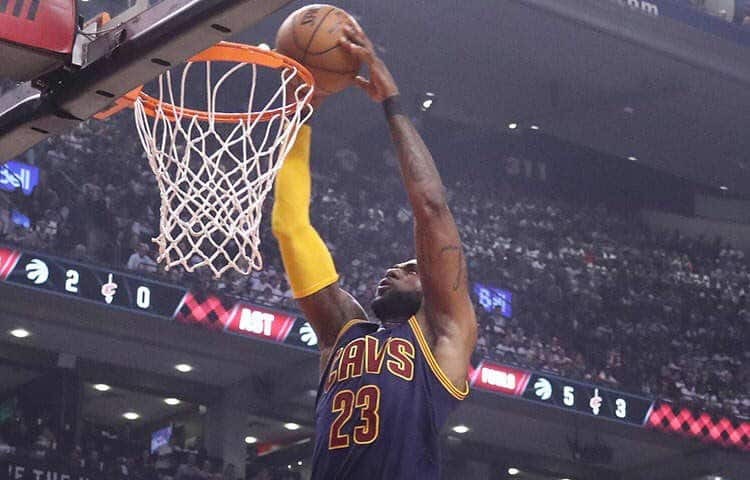 The Toronto Raptors hope that returning home would give them the boost they needed to turn their series with the Cleveland Cavaliers into a competitive one. For about three quarters it appeared that they might be able to do just that. But then the same thing that often tends to sink the Raptors did. When they needed to be making shots the most—they couldn’t hit one if their lives depended on it. After taking a 53-49 lead into halftime, the Raptors found themselves still within reach entering the fourth quarter—but down by two, 79-77. For the first time in the series, the Raptors were not being blown out entering the final quarter. Toronto had a legitimate shot to win. But then they missed ten of their next eleven shots. James led the way for Cleveland with 35 points followed by Kevin Love and Kyrie Irving with 16 points each. Kyle Korver chipped in 14 points off the bench (4-6 from three-point range). DeMar DeRozan did what he could for the Raptors with 37 points but only had one in the fourth quarter. Jonas Valanciunas added 19 points, and Norman Powell chipped in 13. Kyle Lowry sat out due to the ankle injury he suffered in Game Two. While winning the series is still the ultimate goal, Toronto will be hoping to salvage a little pride and not be swept at home. Game Four will be Sunday in Toronto at 3:30 PM ET on ABC. There was some concern over how well the Spurs would handle losing Tony Parker. Last season, when he struggled in the postseason, they lost. This season, he has been the team’s leading scorer behind Kawhi Leonard. Who would step up and replace his production? Friday night in Game Three it was LaMarcus Aldridge. 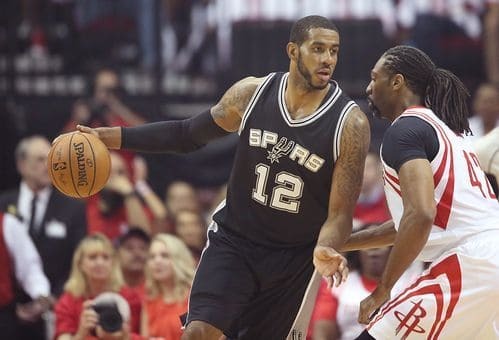 After scoring just 19 points in the first two games against Houston, Aldridge put up 26 points Friday night to help San Antonio win in Houston and take a 2-1 series lead. The Rockets led after the first quarter, but much like in Game Two, when the shots quit falling (and San Antonio’s did) they fell behind. Their two-point lead slipped away in the second quarter and turn into a four-point deficit by halftime, 43-39. Houston kept it close in the third quarter but they failed to close the gap and entered the final quarter down by six, 66-72. They remained close for a few minutes in the fourth but the Spurs slowly edged out to a 15-point lead with 2:38 to play. After exploding for 126 points in Game One, the Rockets have been held under 100 points in back to back games, a first for the team under Mike D’Antoni. James Harden did his best to contribute with 43 points but didn’t get much help from anyone else. Only two other players scored in double figures, Trent Ariza (17 points) and Clint Capella (12 points). Since making 22 three-pointers in Game One, the Rockets have only made 23 total in Games Two (11) and Three (12). If they are going to be able to get back in the series, they are going to need to find a solution to San Antonio’s defense and start putting some points on the board again. They’ll get their chance in Game Four Sunday night at 9 PM ET on TNT.